In a Pizzeria, after a visit to one of my favourite London spots (the Soane Museum) Jay Cross asked me what I thought fuelled good learning. My answer was ‘habits’. 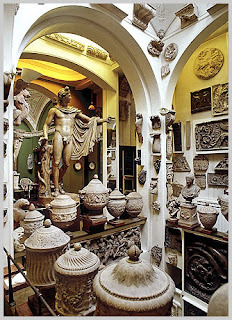 Soane was a habitual learner and collector. Strong, autonomous learners tend to have developed habitual learning, whether in reading, blogging, conversing, taking notes and so on. They all have different sets of habits, but habits they have in abundance. This is a good example. Some bloggers start but tail off, others work at it and keep going for years, benefiting from the opportunity to habitually structure their own thoughts, get feedback, reflect and LEARN. Stick with a new habit until it takes root. Habits fall away unless stuck to for some time and with some vigour. Always take something to read or listen. Autonomous learners always have something in their pocket or bag in what Marc Auge calls Non-Places – trains, airports, planes, automobiles, hotel rooms etc. Take notes. The best way to ensure that knowledge sticks is to write it up in your own words. Studies show between 20-30% increase in recall when you take notes. Habitually encode. Habitual learners simplify and structure the stuff they want to remember in the right order. Replay and recall. Effective learners voluntarily recall what they’ve learnt at intervals after the event. Recall that talk on the way home from the conference, recall your holiday on the plane back. Customise habit forming feeds. Customise your home page to encourage your bountiful learning habits. Kick-start new learning habits. Blog, subscribe to a new magazine, feeds from new sources, use a new tool on web – good learners are always adding learning habits to their repertoire. Of course we know a lot about the power of habits, especially bad ones such as smoking, eating fatty foods and gambling. Recent research confirms that habits may form familiar neural pathways which makes it more difficult to break the pattern of behaviour. It would seem that these neural pathways get triggered if the habit cues return, hence recidivism in smoking, alcoholism, drug abuse etc. However, it is the nurture of good habits in learning that matter, and there are two interesting thinkers who see habit as lying at the core of learning, Locke and William James. Sorry to get a little detailed here, but it’s worth recalling what they said. John Loc ke, the greatest philosopher of his age, laid the foundations for empiricism and the enlightenment view of knowledge, politics and education. Breaking free from medieval scholasticism, and disaffected by the educational habits of his day, he put forward a sophisticated theory of education built, not around the transmission of information, but the shaping of habits and character around wisdom and virtue. These theories, grounded in his liberal, political philosophy, are written in Some Thoughts Concerning Education (1692). The book was widely translated and became a manual for education among the upper classes for most of 18th century. The book is a series of very practical methods for encouraging good habits and character right down to details on curiosity, games, language learning, dancing etc. He recommends educational methods that focus on example and practice, rather than the teaching of information and principles. In this sense, it is not learning that matters, but the establishment of good habits. It is repeated practice that instils these worthy behaviours so that they become instinctive. The concrete rather than the abstract is recommended for the reinforcement of such good habits. The learner must not be coerced into learning but made to feel as if it is in their own interest, and that they are acting from their own free will. Not that children should be spoilt. For those of a vocational bent he recommends practical skills and understanding. Beyond this, his focus is on a healthy mind that has the basics in reading, writing, arithmetic, a knowledge of literature along with the natural and social sciences. But not the arts, which he regarded as either useless or dangerous. Detailed scholarly study should be left to those who want to become scholars. He does not recommend school for those who can afford tutors, and sets great store on the enthusiasm of parents, and the family in general. Schools, he thought, merely perpetuate bad company and bad habits of behaviour. A child is a member of both a family and nation with the individual having the right to life and liberty. It is the idea of a free mind, that uses the power of reason to become contributory, autonomous adults in a free society that mark out this educational theory based on political belief. Like Lock e, he wrote a practical book Talks to Teachers (1899), originally a series of lectures, giving practical advice to teachers. The difference is that psychology had now become, through his efforts, a science, and its principles could be used in educational theory. It was here that he put forward his now famous theory on learning by doing. This was to heavily influence John Dewey, and the future of educational theory through to Kolb and others. The book doesn’t pretend to have all the answers, as psychology is a science; teaching an art. But some psychological principles are clear. Education is, above all, the organization of acquired habits of conduct and tendencies to behaviour. Children should not be expected to learn by rote. Their experiences must be turned into useful and habitual behaviour through action. The learner must listen, but then take notes, experiment, write essays, measure, consult and apply. He recommends learning through work and the creation of real things or dealings with real people in a shop, to give you educational experiences beyond mere theory. He was in fact a firm advocate of vocationally oriented schools and work-based learning (relevant today or not?). The supervision of the acquisition of habit is another of his principles. Habit is the enormous flywheel of society, and should be exercised until securely rooted. The result of almost all learning is this habitual behaviour. Association, interest, attention, will and motivation; these are James’s driving forces in education. In addition there’s memory, curiosity, emulation, constructiveness, pride, fear and love - all impulses that must be turned to good use. This is not to say that he favoured a lazy, or what he called ‘soft pedagogics’. He recognized that learning was sometimes hard, even arduous. 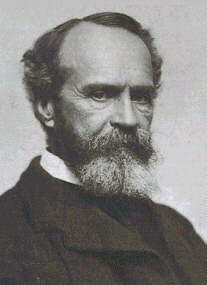 William James devotes chapter 4 of ‘The Principles of Psychology’ to habit and outlines some principles for the acquisition and sustainability of good habits, including; launch yourself with as strong and decided an initiative as possible, never suffer an exception to occur till the new habit is securely rooted in your life, seize the very first possible opportunity to act on every resolution you make, and on every emotional prompting you may experience in the direction of the habits you aspire to gain. Very interesting posting. What this reinforces for me is that, if we are to reduce our dependence on top-down education and training, then we have to learn how to learn. Who's responsibility is this? Is this something we have to figure out for ourselves or is this the one and only piece of top-down education we really need? Right on, Clive. It's the only piece of education we need. Great post Donald. Clive: Maybe this actually is the only piece of top-down education we need. If good habits are a standard a leader, family or community practices, a learner will have the support or structure needed if he chooses to adopt the rules and rituals. If good habits become a way of life, which can definitely be an individual, family or community activity or value and the learner has opportunities to practice and increase good habits alone or with other like-minded people, learning will increase based on quality experiences that provide tangible results. PS. Mark, I'm already all over developing and marketing "H-Learning" 2.0 applications for corporations looking to increase widgets sold quarter over quarter. Learning is habitual. Some people have to be re-taught how to learn. Frequently the public education system here in the US penalizes learners for experimentation and failure. The habits learned are to not to try unless you are sure of success. "Successful" students go with the herd. I believe the 7 habits effectively summarize skills that learners need to employ. I love the thought of reinforcing good habits and would be interested in your list of 7 principles of good teaching and how they mesh with the habits. What can we do to motivate learners and inculcate these habits or are you suggesting that effective learners don’t require motivation because it’s all such fun! 7 habits of good teaching? 1. Don’t put agenda or list of learning objectives at the start – grab them with a story/anecdote, question or provocative act. 2. Audience cognitive participation is essential i.e. exercises that make them think. 3. Tell all students to take notes (in their own words) as this leads to 20-30% increase in retention. 4. Use NO text on PowerPoint – only images/video. 5. Record your session as audio or video - it’s stupid not to give learners second bites of the cherry. 6. Apply reinforcement techniques after the teaching (10 mins, 24 hours, 7days) is a simple way of doing this – massively increases retention. 7. Use online resources for subsequent follow on – email, blogs, wiki, web research etc. "Take notes. The best way to ensure that knowledge sticks is to write it up in your own words. Studies show between 20-30% increase in recall when you take notes." Wrong. IF you've recently read this (yes, I'm 100% certain you have not personally researched it as that is innovative) pls cite research and the methodology/ conditions. I guarantee it's flawed, and so to are you for believing it! I'll post my research once you've cited and posted the trash you've read. A very tall book end! Calm down - it'sonly training! My goodness, the mask of anonymity does make people very brave! Is your research so brilliant that you can't name yourself? Learners can be given generative techniques including note-taking, creating summaries and creating analogies. These generative techniques have been shown by Kourisky and Wittrock (1992), to lead to a 30% gain in learning. Note-taking has been shown in many studies to increase the effectiveness and transfer of learning. Dee-Lucas and DiVesta (1980), Peper and Mayer (1986), Shrager and Mayer (1989), all showed how note taking increased learning and transfer across a range of learnt subjects. The generation of summaries and analogies were shown to increase learning by 30% and 22% respectively, by Whittock and Alesandrini (1990). Let me explain how research works. Everyone doesn't have to do their OWN research - it's peer-reviewed and published. So, anonymous, let's have it - if you're the genius who has published the definitive research in a scientifically reputable journal, I'll concede (after I've read your research). You do not know me but... I would like to let you know that I am currently writing a paper on similar material.While fooling around on the web, I found this. It was helpful and will be found on the works cited. Thanks! thanks for contribution. very nice and useful article..